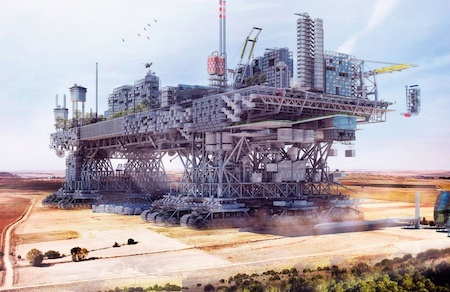 Very Large Structure is a proposal by Manuel Domínguez for a mobile land management mega-machine for Castile and León in Spain. ...lookouts on the high watchtowers spied the mining town, gnawing at the salt flats twenty miles ahead... [the] mining town saw the danger and turned tail, but already the huge caterpillar tracks under London were starting to roll fostering faster. Soon the city was lumbering in hot pursuit, a moving mountain of metal which rose in seven tiers like layers of a wedding cake, the lower levels wreathed in engine smoke, the villas of the rich gleaming white on the higher decks, and above it all the cross on top of St Pauls Cathedral glinting gold, 2000 feet above the ruined earth. For a much earlier take on the basic idea, see the steam-powered houses from Henry Loudon's 1828 classic The Mummy! A Tale of the Twenty-Second Century. 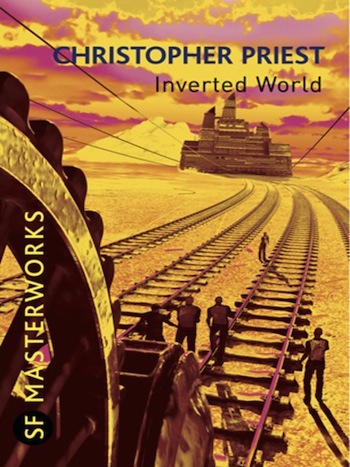 Update 11-Feb-2013: See also this cover art from the novel Inverted World by Christopher Priest. 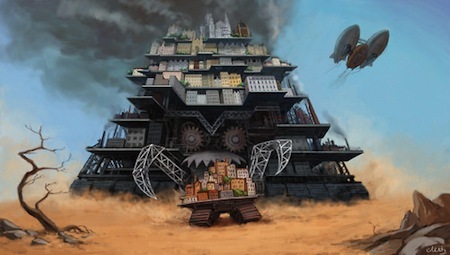 In the novel, Helward Mann lives in a city called "Earth", a giant structure that is slowly winched along on a set of tracks forever northward. Thanks to GwenH for writing in with this reference. End update.